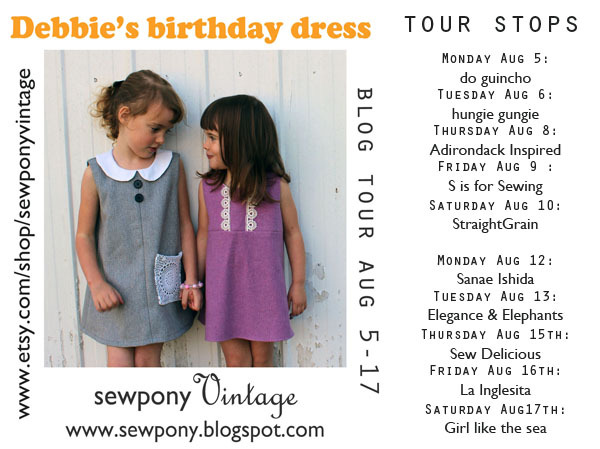 BLOG TOUR: Debbie's birthday dress and some THANKYOUS!! I am excited about the next two weeks...I have recruited ten wonderful bloggers to make and photograph my pattern - Debbie's birthday dress. Starting this Monday (5th), sewpony will host it's first blog tour. A 'blog tour' is a great way to view different takes on a pattern and to see how it comes up in different fabrics and with varying tastes. I am proud to call all these ladies 'friends' and am so grateful to have them showcase my pattern! To my pattern testers: Marta, Sanae, Erin, Tara, Ros my sister Jules and good friend Katrina. Thanks so much guys - I really appreciate all your feedback and the time you took to help me out! Especially to Tara who received several dud PDF's when I tried to send her the pattern early so she could make it up before having her baby! Thanks also to my friend Susie for being my emergency 'go to' person when I got stuck with Illustrator. Thankfully Susie lives just around the corner so a couple of quick visits with my laptop before kinder ensued when I ran into trouble! To An from StraightGrain for your initial tips in starting out. To Melissa from MellySews for putting together just what I needed to start digital pattern making - a great e-course for the complete beginner. do guincho, hungie gungie, Adirondack Inspired, S is for Sewing, StraightGrain, Sanae Ishida, Elegance and Elephants, Sew Delicious, La Inglesita, Girl like the sea. Really looking forward to this tour and sharing my Debbie's Birthday Dress! Thank you, Suz! Thanks Heidi!! I am so excited to see everyone's dresses!!! Gorgeous - can't wait to see what they all do.